Stitches used: ch, sl st, sc, hdc, dc, love knot. Love Knot (ch 1 loosely, sc in the hump on the back of the chain). ROW 1:Sc in 2nd ch from hk and in each ch across. (19 sc). Ch 4 turn. ROW 2: [EYELET ROW] * Sk next st, dc in next st, ch 1. Rep from * across. Dc in last st. Ch 2, turn. ROW 3: Hdc in each ch 1 sp and in each dc across. Ch 2, turn. ROW 4: Hdc in each st across. Ch 2, turn. ROWS 5-24: Rep Row 4. ROW 25: Hdc in each st across, Ch 4, turn. ROW 26: [EYELET ROW] * Sk next st, dc in next st, ch 1. Rep from * across. Dc in last st, ch 1, turn. ROW 27: Sc in each ch 1 sp and in each dc across. Fold piece in half, placing first and last rows together. (Eyelet rows should be aligned). With folded edge on the bottom, attach yarn through both layers in the upper left hand corner. Ch 1, sc to join both layers at the end of each row and place 2 sc around the posts of the corresponding dc stitches. Turn piece over and repeat to join the other side. Once sides are stitched together, turn the purse inside out. 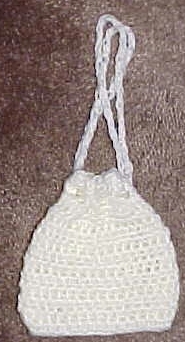 DRAWSTRING: Work a string of love knots till the string is approximately 24" long. Fasten off. Weave the drawstring in and out of the eyelet row going around the entire purse twice. Join the ends of the drawstring together. Pull on two opposite ends to draw the purse closed.